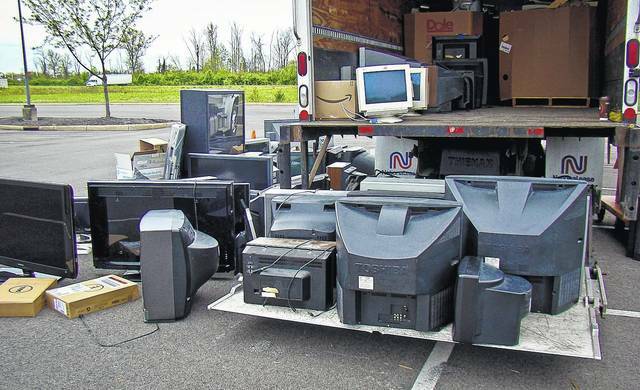 During Orange Township’s 2017 Earth Day event, the 24,000 pounds of discarded electronics collected by township officials, dropped off by residents, was estimated to have filled one-and-a-half semi-truck trailers. The second annual Earth Day event is scheduled for Saturday, April 21 at Home Depot on Owenfield Drive. In honor of Earth Day, Orange Township will hold its second annual Electronics Recycling Event from 10 a.m. to noon on Saturday, April 21, at Home Depot, 8704 Owenfield Drive, Powell. In 2017, during the township’s first event, 24,000 pounds of old, outdated, and unwanted electronics were collected from township residents. Last year, Home Depot volunteered to be a full-time electronics collection site, allowing people to drop off items year-round into a collection bin located in front of the store. The partnership continues with Accurate IT Services, allowing Home Depot to be a collection site for residents to drop off their old electronics throughout the year. While most electronics are accepted free of charge, there is a small cost to dispose of TVs. Sheterom said during this year’s event, the township will accept TVs, computers, laptops, servers, cell phones, keyboards, computer mice and cables, tables, printers, UPS & battery backups, phone equipment, lead-acid batteries, car batteries, networking equipment, routers, cameras, stereo equipment, power tools, video game systems, cable boxes, and most items that plugin, work on batteries, or have a cord or cable. However, there will be a $10 charge to dispose of flat panel televisions, LED, LCD or plasma panels, and a $40 charge for CRT monitors and rear-projection TVs. Only exact cash or checks can be accepted at the time of drop off on Saturday. Sheterom said items that will not be accepted include air conditioning units, dehumidifiers, freezers, refrigerators, light bulbs and alkaline batteries. She added the event was made possible through the efforts of Orange Township Trustee Debbie Taranto, Fire Captain Scott Rice, and through partnerships with Accurate IT Services, Delaware General Health District, the DKMM Solid Waste District and Home Depot. Individuals with questions about the disposal of old electronics can contact Accurate IT Services at www.AIT-Recycle.com or call at 614-453-0709. This entry was tagged Amanda Sheterom, D. Anthony Botkin, Debbie Taranto, Orange Township, Scott Rice. Bookmark the permalink.